This book aims to stimulate and promote the wide-ranging aspects of green chemistry and its major role in ensuring sustainable development. The book covers the following areas: green chemistry; green reagents and atom economy; safeguarding the atmosphere; industrial green catalysis; alternative reaction conditions; biocatalysis and green chemistry. 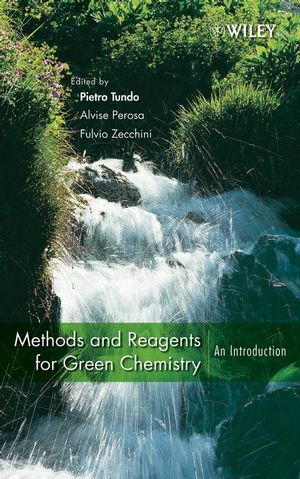 This book is based on the third edition of the Collection of Lectures of the Summer Schools on Green Chemistry held in Venice, Italy in the summers of 1998-2003 (sponsored by the European Commission, TMR and Improving Programmes and carried out by the Consortzio Interuniversitario La Chemica per l'Ambiente). Pietro Tundo, editor, is Full Professor of Organic Chemistry at the University of Venice. He has published over 200 scientific articles and one book, and holds twenty-five patents. His research on clean processes led to the development of Gas–Liquid Phase-Transfer Catalysis, a method for the synthesis of non-steroidal anti-inflammatory drugs. Alvise Perosa, coeditor, is Assistant Professor of Organic Chemistry at the Università Ca' Foscari in Venice, Italy. Fulvio Zecchini, coeditor, is a senior researcher at the Interuniversity Consortium "Chemistry for the Environment" in Venice, Italy, in the field of bioremediation of water and soils. 1. The Four-Component reaction and Other MultiComponent Reactions of the Isocyanides (Ivar Ugi and Birgit Werner). 2. Carbohydrates as Renewable Raw Materials: A Major Challenge of Green Chemistry (Frieder W. Lichtenthaler). 3. Photoinitiated Synthesis: A Useful Perspective in Green Chemistry (Angelo Albini). 4. Dimethyl Caronate as a Green Reagent (Pietro Tundo & Maurizio Selva). PART 2. ALTERNATIVE REACTION CONDITIONS. 5. Ionic Liquids: "Designer" Solvents for Green Chemistry (Natalia V. Plechkova and Kenneth R. Seddon). 6. Supported Liquid-Phase Systems in Transition Metal Catalysis (Alvise Perosa and Sergei Zinovyev). 7. Organic Chemistry in Water: Green and Fast (Jan B. F. N. Engberts). 8. Formation, Mechanisms, and Minimization of Chlorinated Micropollutants (Dioxins) Formed in Technical Incineration Processes (Dieter Lenoir, Ernst Anton Feicht, Marchela Pandelova, and karl-Werner Schramm). PART 3. GREEN CATALYSIS AND BIOCATALYSIS. 9. Green Chemistry: Catalysis and Waste Minimization (Roger A Sheldon). 10. Seamless Chemistry for Sustainability (Johan Thoen and Jean Luc Guillaume). 11. Enantioselective Metal Catalyzed Oxidation Processes (David StC. Black). 12. Zeolite Catalysts for Cleaner Technologies (Michel Guisnet). 13. Acid and Superacid Solid Materials as Noncontaminant Alternative Catalysts in Refining (José M. López Nieto). 14. The Oxidation of Isobutane to Methacrylic Acid: An Alternative Technology for MMA Production (Nicola Ballarini, Fabrizio Cavani, Hélène Degrand, Eric Etienne, Anne Pigano, Ferruccio Trifitrò, and J. L. Dubois). 15. Biocatalysis for Industrial Green Chemistry (Zhi Li, Martin Held, Sven Panke, Andrew Schnid, Renata Mathys and Bernard Witholt).